The Utah rental agreements are designated for a landlord’s right, under Title 57 – Real Estate, to elect an individual the right to lease their property. The tenant will be expected to pay rent and the oblige to all the terms of the contract while the landlord will be responsible to keep the space in livable condition. Upon signing the document both parties shall be legally bound to each other. Rental Application – A form designed to allow the landlord to view all the finances on behalf of the lessee in addition to their employment history, credit reports, previous tenancy, and any other references deemed appropriate. Commercial Lease Agreement – For industrial, retail, or office type of space that is not livable. Lease with Option to Purchase Agreement – For the use of standard tenancies along with the added option of being able to buy the property in accordance with the terms agreed to by both parties. 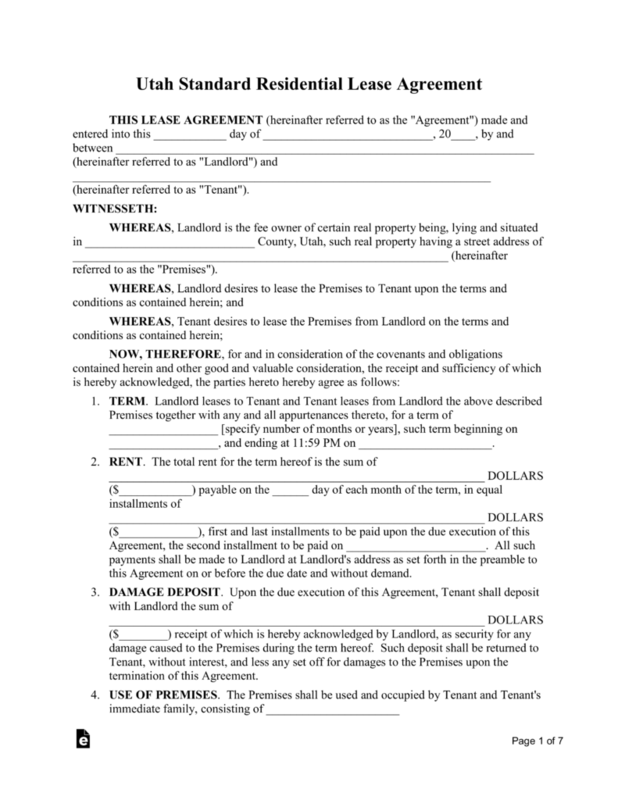 Month to Month Lease Agreement (§  78B-6-802) – State law allows a tenancy at will to be terminated with fifteen (15) days’ notice by either landlord or tenant. Room Rental (Roommate) Agreement – Used as a means for individuals sharing a home to establish guidelines and rules for the common areas and how much each must pay for certain expenses. 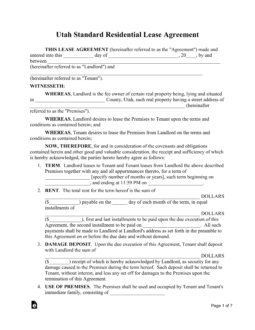 Standard Residential Lease Agreement – Residential contract with a start and end date. Usually one (1) year and the most commonly used rental form. Sublease Agreement – A way for a tenant under agreement to rent the premises, known as a ‘sublet’, to someone else, known as the ‘sub-tenant’, until the end of their master lease term. This type of tenancy must usually be approved by the landlord. Termination Lease Letter (§ 78B-6-802) – Notice given to either landlord or tenant to signify their intention to cancel their month to month arrangement by granting the other party fifteen (15) days’ notice. Lead-Based Paint – The owners/landlords/managers of residential units built before 1978, according to federal law, must fit any new tenants with disclosure of the possibility of lead paint in the walls and ceilings. Move-in Checklist (§ 57-22-4) – Prior to signing a rental contract the landlord must give the tenant a checklist of the current condition of the premises. Afterwards the tenant shall have reasonable time to conduct their own inspection of the property and report back to the landlord. According to § 57-22-4 the landlord must give at least twenty-four (24) hours notice before entering the leased property. Maximum – No State maximum, the landlord may ask for as much as they feel reasonable. Returning (§ 57-17-3) – Landlord must return all funds related to the deposit within thirty (30) days from the date of termination.